c) two light sources, so the interference is with two light waves. 2) blue regions are areas where the net displacement is negative (such as when two troughs overlap). 3) In the black regions, the net displacement is zero, or close to zero. To understand this pattern, we use the idea of the path-length difference, S1P - S2P. There is a movable blue-point P in the simulation. The path-length difference (∆L) for this point is the distance the point is from one of the sources minus the distance the point is from the other source, or simply S1P - S2P. These distances are expressed in units of the wavelength λ. When the sources send out waves that are in phase with one another, the waves will interfere completely constructively when the path-length difference is an integer number of wavelengths, and they will interfere destructively when the path-length difference is an integer number of wavelengths, plus half a wavelength. We can express this in the form of equations. 1 First, press the Play button to start the simulation running. One thing the simulation can help with is in understanding how this interesting pattern is formed, from two sources that put out identical single-frequency waves. Click-and-drag the blue dot P to change its location on the screen. You should observe that, whenever the blue point P is at a position in which there is a large amplitude displacement, that the path-length difference for that point (shown in blue bar at the bottom right) is an integer number of wavelengths (or close to it). In contrast, whenever the blue point P is at a position in which there is generally no displacement (it's always dark there), the path-length difference for that point is an integer number of wavelengths plus half a wavelength (or close to it). 2 Explore different points on the line joining the two sources. In between the sources, along the line joining the sources, you should observe a standing wave, with nodes (zero displacement points) and anti-nodes (maximum displacement points) that are fixed in position. For a node, you should measure a path-length difference that is close to an integer number of wavelengths plus half a wavelength. For the anti-nodes, you should observe a path-length difference that is close to an integer number of wavelengths. Is this what you find? Explain why you will always find an anti-node at the place that is halfway between the two sources. 3 Let's keep exploring what happens along the line joining the two sources, but now place the blue point P on this line, to the right of the source on the right. Adjust the frequency of the waves, or the x-coordinate of one or both of the sources, until the path-length difference is 3 wavelengths. Is constructive interference taking place at the point, or is it destructive interference? What is the distance between the sources (expressed in terms of wavelengths) in this case? Repeat, when the path-length difference is 3.5 wavelengths. 4 The wave speed has a constant value in the simulation. With the wave speed constant, what happens to the wavelength when the frequency is increased? In general, what happens to the pattern when the frequency is increased? 5 In general, what happens to the pattern when the two sources are move closer together? 9 added coherence and incoherence check-box for exploring what if scenario for exploring in-depth the meaning of incoherence. 10 added screen effects (instantaneous patterns and average intensity patterns) of the interference patterns for both coherent and incoherent sources from http://www.cabrillo.edu/~jmccullough/Applets/OSP/Oscillations_and_Waves/waves_interference.jar by Juan M. Aguirregabiria. now it is very easy to visualize the meaning of coherent sources. made the screen on the right more obvious by adding BR text "screen on the right"
fixed the bug by moving the codes to evolution page instead of fixed relationship, was difficult to find the bug or cause, but i did it! dded a margin 10%, now can see the maximum and minimum values of 2 and -2 easily. the real difference today is i can make interactive java applet standing on the giants of Open Source Physics community instead of the conceptual paper i did which is pretty much just struck at the an idea stage. Wolfgang for Open Source Physics ! and many others whom i have not met but have learnt for the source codes and simulation! (d) explain the meaning of the term diffraction. 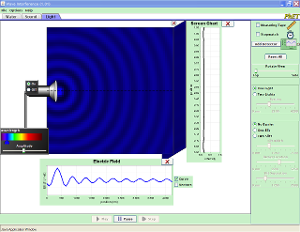 (e) show an understanding of experiments which demonstrate diffraction including the diffraction of water waves in a ripple tank with both a wide gap and a narrow gap. (f) show an understanding of the terms interference and coherence. (g) show an understanding of experiments which demonstrate two-source interference using water, light and microwaves. may have to finer customized some more the meaning for coherence. the best way to demonstrate understanding of coherence is to get students to use Ejs to change the codes inside. when v1 =! v2 & f1=!f1 & lambda1=! lambda2 it will result in phi1=! phi2 in general except for those time of coincidence! The less pedagogy effective method but more time efficient method is to make it happen in the sim by teacher. the trade offs of deep pedagogy learning vs efficient time. posting from Kuala Lumpur, Malaysia! Holiday! sick today so at home. a side view versus time of the displacement at point P. as suggested by chee wah, i think the original sim had it already. As we explore the EJS, we realize that after some time, it seems that the resultant pattern was not correctly represented. We wonder if there might be a bug there. I have attached a word document for your reference. i fixed the bug by moving the codes to evolution page instead of fixed relationship, was difficult to find the bug or cause, but i did it! Also, we found that there may be no need to move the source horizontally, thus would it be possible to remove the slider-bars so as to keep the platform neater. 1. Currently in the graph mode, the pattern shifts right to the top and it is difficult to identify the position of P. I wonder if the graphs could be shown individually on the right side of the panel so that the students know which graph corresponds to which source and know which is the resultant wave. I would propose that the size of the pattern should remain the same, if possible. i added a margin 10%, now can see the maximum and minimum values of 2 and -2 easily. 2. Currently, after running the EJS in the graphical mode and pausing it to show the step function. The graph continues to show the same shape. Clicking the step button causes the graph to shift forward in time, I was a bit confused initially trying to interpret the implication of the graph. I wonder if there is any way to help clarify this by looking at the graph. If not, I suppose the worksheet will need to try explain the meaning of it. the graph data was currently is set to display only 75 data-points, to save memory. if i set to infinity, it will slow down as the calculation to display all the infinity point takes a lot of memory. 3. After pausing the EJS, I start to shift point P around. Initially the graph still looks sinusoidal but after some time, the graph shows vertical line corresponds to the particular time paused. As the lines all overlap, I could not figure out what they are the values of the lines. The line does not seem to correspond correctly to the pattern as I shift point P around. the student-scientist need to understand the graph shows old data, to collect new data on new position of P, click play again to start collect y1+y2 at P.
the values can be read from the bars on the right. Thanks for the great simulation! On a side note, for those who downloaded the file *.jar, Windows7 may associate it as a zip file. What my TA did was to change the file extension to jar instead of zip. To view the file extension, you would need to go the folder option/view and unchecked the "hide file extension". Hi, my colleague prefers to view the JS without colors. Can this be the default screen? Also it seems that the legend slows down the system a bit. We think there may be no need for the legend, if it affects the computation. Ty. i didn't notice it on my computer, i ran for >100 seconds. fix a useability issue of S12 and S2 draggable on simulation is playing, change to only when paused. May I share one computer model on ripple tank that I have designed for learning, for your use and further sharing-scaling up (a MP3 goal) with others interested in physics. Download after login, registration is free. 4. Innova JC , Chee Wah and Soo Kok for useful feedback to customize to their L&T requirements for their research in eduLab. From a teacher Thu 1/5/2012 4:13 PM. Yes, I suppose you are right that we may do away with the intensity graph as it looks pretty good with the current features. I suppose we can design the worksheet to check how students perceive from the pattern the intensity-position graph. For the computer hanging of the JS, it seems that I didn't encounter it this time round with the update. We will explore further to see if it gives us problem again. 1. In the full screen mode, the graph seems to be occupy about a fifth of the screen. I wonder how it would look like if it occupies say a third? On the other hand, the size looks perfectly fine so long as I do not maximize the EJS. 2. I observe that the bar for S1P and the line S1P are in purple[magenta] while the S1 source is in red. Is it intended to be so? Thanks for the great EJS. We are truly impressed. We prefer the previous design but we are wondering if the size of the graph can be made a bit bigger, in compromise of either the wave pattern or the fringe pattern. One suggestion is as shown in the document. You may make other adjustment as you deem necessary. i set the graph to be width = 450, in full screen view, it looks great. in applet default view, it looks big. done made " |S1P-S2P| = 0.## "
2. Can the distance S1P - S2P, Px and Py be shown to 2 s.f.? 3. Also, was wondering if there is a need for the pop up when we first open the EJS? The information provided may be slightly different from the activities that the students would be exploring. It seems that you have yet to change Px and Py to 2 d.p. Also, realised that at destructive interference at some position, it shows S1P = 8.47 and S2P = 7.96 but the difference is 0.50(lamda), I suppose it is due to the division and rounding off. Is there a possibility of having this fixed? yes, i think i see some rounding off error, but i don't know if it is serious bug that need to solve. the error seems to be possible when the user drag the point P, i think it is a trade-off between round-off error possible sometimes or disable the drag-gable point P.
discontinued a best version with legend and autoscale. added pen paper representation to support transfer of learning to examinations questions in pen paper format. Thanks. but the wave fronts drawn by pen look funny. There seems to be additional unnecessary wave fronts appearing at the same time. Introduction Video on the features of the computer model as a guide to support learning. this video made as a research response to improve student's experience and learning by supporting teachers in setting the stage, giving the basic features of the inquiry lesson to come, for student centred inquiry with computer model as a tool. the teacher will play a even bigger role in facilitating learning because the tool adds interactive engagement and visualization that traditional tools cannot support. trying to figure out if tracker can be used to determine useful curriculum learning. seems to be possible to determine the velocity of wave when a length is assumed. since we know the video i n phase sources, by observing the bright light at S1 and S2 happens together. the centre line, say length is set at 4.659E-1 m from S1 to P where P is a bright interference. by stepping the video,for simplicity 4 steps result in t = 0.133 s = T.